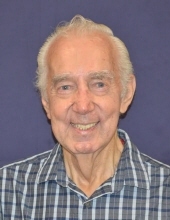 Darrel Murry Keiser, formerly of Toledo, OH, and Sun City, AZ, passed away on March 31, 2019 at the Vitas Hospice Center in Rockledge, FL. He was 88 years old. Darrel was preceded in death by his wife, Alice (Baker) Keiser; his son, Kenton Keiser; his parents, Raymond and Freda Keiser; and his sister, Donna Kasprzak. He is survived by his brothers and sisters, Darwyn Keiser, Darleen Oldenburg, and Diane Eisenhauer,; his daughter, Tina Thompson; his son-in-law, Bill Thompson; his daughter-in-law, Connie Keiser; his grandchildren, Michael Thompson, Lauren Thompson, Jecoby and Lisa Keiser, and Corey and Crystal Keiser; and 11 great-grandchildren. Darrel was born in Delta, OH. He served in the United States Air Force in Maine and Alaska from 1951 to 1955. He met and married Alice Baker, formerly from Arkansas, in 1959. While Darrel enjoyed several careers, he is best known for owning and operating Keiser’s Fine Foods, a wonderful small restaurant and motel in Monclova, OH, during the late 1960s through mid-1980s. After Alice passed away in 2012, Darrel moved from Sun City, AZ to Merritt Island, FL to live with his daughter and son-in-law. He was loved and will be missed by his friends and family. Friends and family are invited to a visitation on Saturday, April 13, 2019 from 10:00 a.m. until the time of funeral services at 11:00 a.m.at Peinert-Dunn Funeral Home, 6603 Providence St. Whitehouse, OH. Pastor Bill Thompson will officiate. Burial will follow at the Whitehouse Cemetery. To leave an online condolence please visit www.dunnfuneralhome.com . To send flowers or a remembrance gift to the family of Darrel Keiser, please visit our Tribute Store. Burial will follow at Whitehouse Cemetery. "Email Address" would like to share the life celebration of Darrel Keiser. Click on the "link" to go to share a favorite memory or leave a condolence message for the family.